The Artful Dodger is quite a character. In fact, it gets its name from a character in the classic novel, Oliver Twist. And its owner, Thom Metroka, is quite a character too. Thom has two passions and purposes in life. 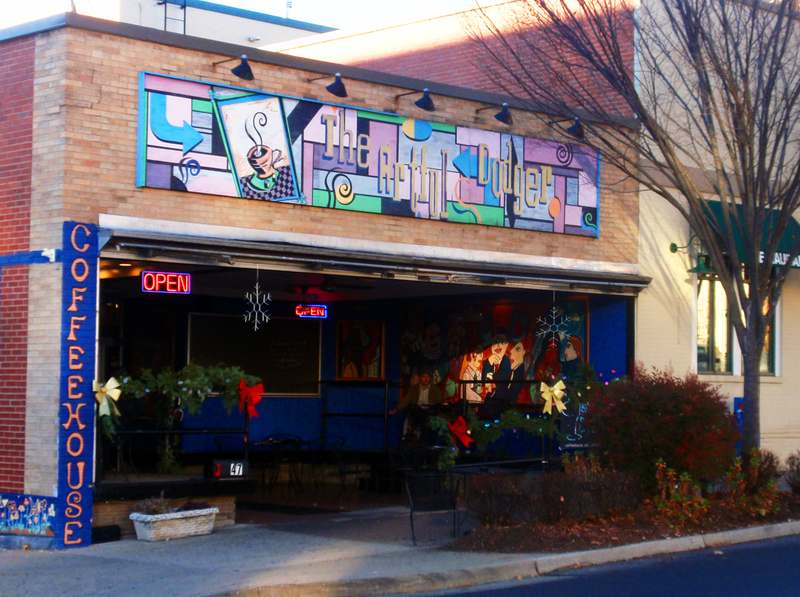 The first is the Artful Dodger, Harrisonburg’s own coffeehouse and cocktail lounge. The second is the Rocktown Rollers, the local women’s roller-derby team. Thom is one of the founders of the team and currently the Skater Coordinator. Thom Metroka enjoys a coffee on the porch of the Artful Dodger. Photo by Eliza Seibert. 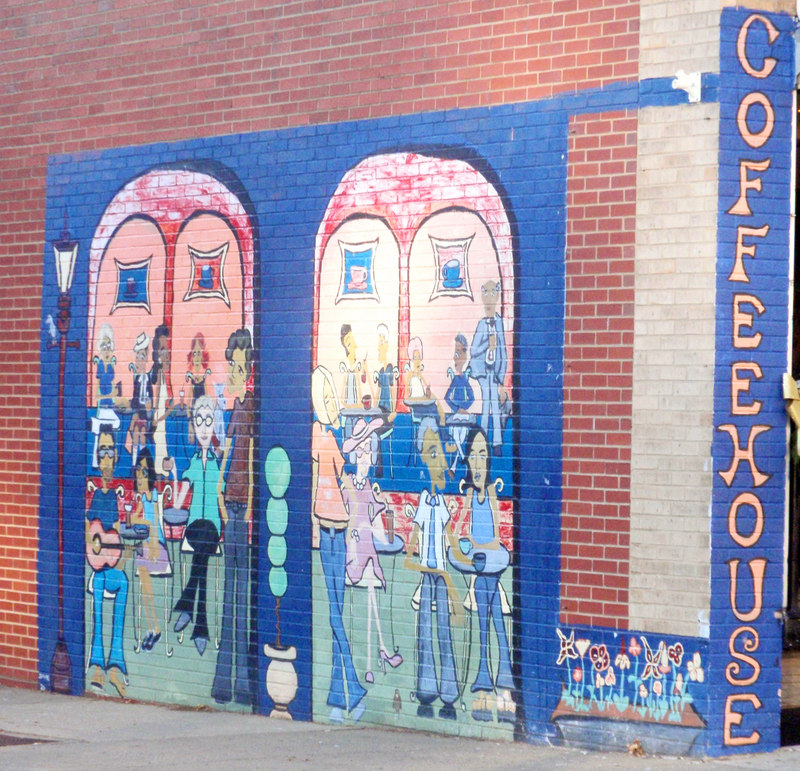 Before becoming the owner and operator of the Artful Dodger, Thom worked as an employee there for seven years. Thom does his best to connect with the community and create a space and environment that brings people together. 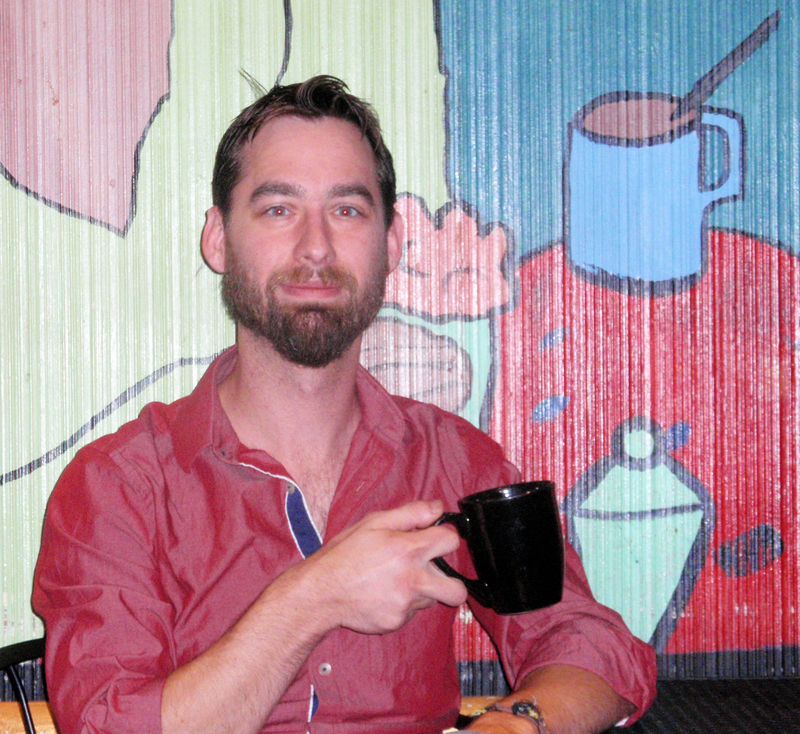 Having grown up in Harrisonburg, Thom remembers coming to the Artful Dodger back when he was in high school. 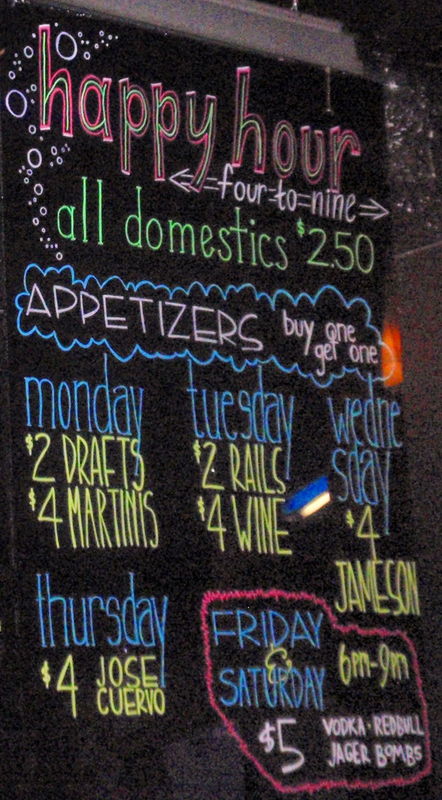 Some of the weekly specials at the Artful Dodger. Photo by Eliza Seibert. The Dodger has quite a selection of unique and inventive beverages. One name immediately caught my attention: the Gingerbread Latte. The description made it impossible to resist: a “signature latte infused with gingerbread and topped with whipped cream and a gingerbread cookie.” I gave into the temptation and bought the latte and I’m so very glad I did. It was sweet and rich. As I sat at the table enjoying my latte and soaking in the atmosphere, I couldn’t help but wonder how this cozy little coffee shop could turn into a late-night bar and club. Mural detail from the wall outside of the Artful Dodger, at 47 Court Square in downtown Harrisonburg. Photo by Eliza Seibert. At the Artful Dodger, every night has something new and different going on. “We have a little bit of something for everybody,” remarks Thom. With their Sunday Night Local events, the Artful Dodger not only gives people something to do on a Sunday night when lots of other establishments are closed, but also the chance to experience local music, food, and drinks in one place. This is a great way for downtown establishments to work together to support the downtown district because, if you shop at one of the participating establishments, the retailer will give you a coupon to be redeemed at the Artful Dodger for a local craft beer or wine and local cuisine for only $5. 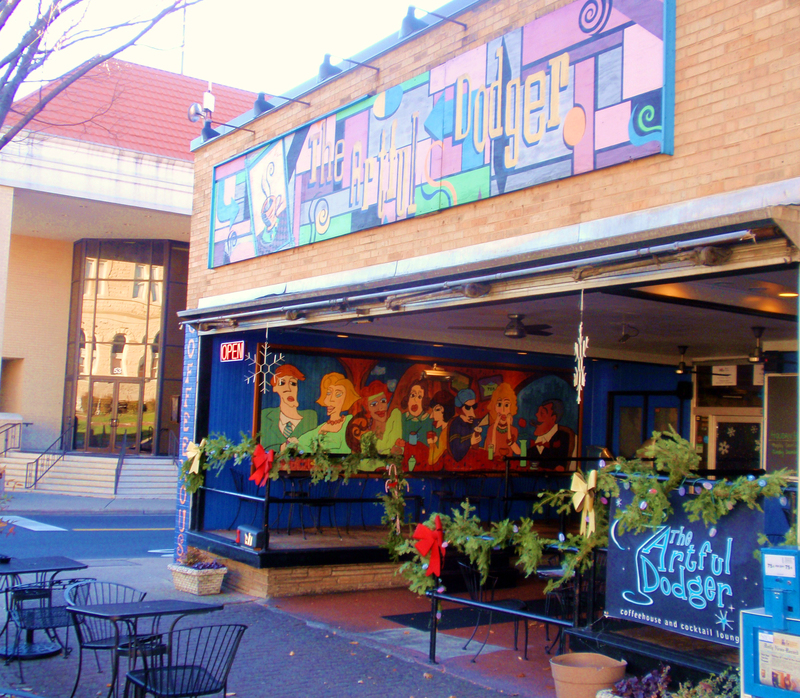 The menu at the Artful Dodger offers everything from sandwiches, wraps, and flatbreads to salads and homemade soups. They also have a variety of vegetarian and vegan options, as well as a weekly special, which you can find on their Facebook page. Breakfast is served all day. “If you want pancakes at 11 o’clock at night, we can make that happen,” says Thom. 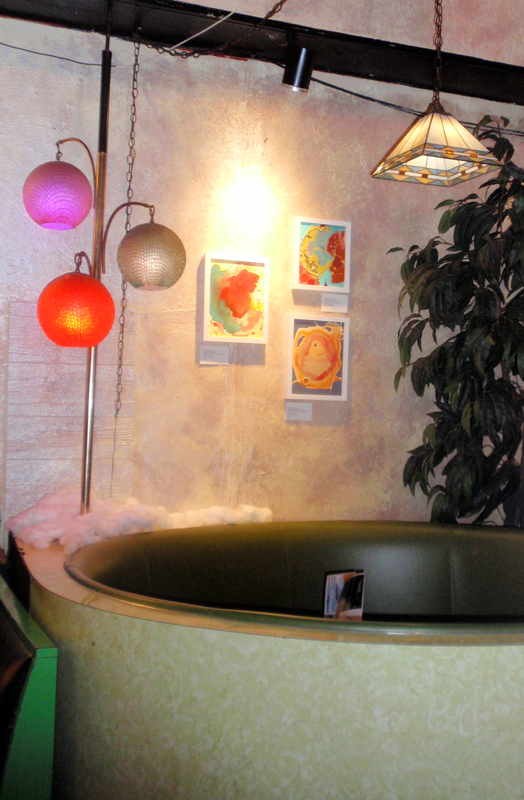 The Artful Dodger supports the local arts community by featuring exhibits by local artists. Photo by Eliza Seibert. In addition to great food and fun, the Artful Dodger also features exhibits by local artists and is a participating location for First Fridays Downtown. Eliza Seibert is a writing intern at Harrisonburg Downtown Renaissance and a senior Writing, Rhetoric, and Technical Communications major at James Madison University.